Local bike enthusiast takes a break at Crawford lookout to enjoy one of the many great views Kelowna has to offer. We are offering this website as a resource to all those who enjoy the thrill and passion of exploring the endless network of mountain bike trails throughout Kelowna and the surrounding Okanagan Valley. The Okanagan is centrally located in the south-central region of British Columbia, Canada is highly regarded as one of the best mountain bike destinations in the world! Recognized for it’s well developed network of parks, trails and it’s long, hot biking season, Kelowna and the surrounding areas offer very desirable destinations to ride roads and trails. Rose Valley, Crawford, Smith Creek, Powers Creek and the MacDougal Rim are just a few of the dozens of awe inspiring mountain bike areas in the central Okanagan. Mountain Bike enthusiasts will find the grueling climbs and thrilling downhills to satisfy and challenge riders of all skill levels. Do you love biking as much as we do? The valley offers spectacular routes for kelowna cycling. The city has recently added the Kelowna Rail Trail that allows you to ride from downtown Kelowna all the way to the Kelowna Airport(YLW). Lakeshore Drive is another fantastic street route. You can cycle all the way from Downtown Kelowna to Okanagan Mountain Park and discover more of Kelowna’s amazing scenery. The locals have developed some amazing mountain bike trails and love to share them with people. We love to get out and ride and encourage others to do the same. Some of the best downhill mountain biking can be found near Kelowna, BC in areas like Rose Valley, Knox Mountain Park, Crawford, Smith Creek and more! 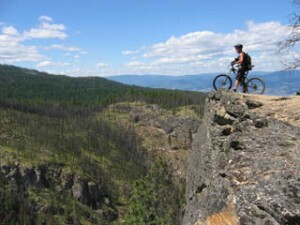 Whether you are into downhill biking or cross country riding, The Okanagan has so much to offer! For more information on local trails and places to ride, check out our great rides where all the local trails are mapped out and waiting for you to explore!